Left inferior retinal detachment with unusual retinal pigment epithelial changes extending into the macula. A 65 year old male was referred for management of a left retinal detachment following recent cataract surgery. A 65 year old Caucasian male was referred by his ophthalmologist for management of a left retinal detachment that was diagnosed following recent cataract surgery. He had also undergone cataract surgery in the right eye 3 months previously. His visual acuities were 6/12 right (OD) and 6/9 left (OS). Intraocular pressures (IOPs) were 10 mmHg OD and 11 mmHg OS. Examination of the left eye showed a clear cornea and a well positioned posterior chamber intraocular lens. There were no cells in the anterior chamber, but a few cells in the anterior vitreous. Fundus examination showed an inferior retinal detachment with a bullous peripheral component, shallow posterior extension into the macula and extensive retinal pigment epithelial (RPE) clumping (Figure 1). There were shallow choroidal detachments inferiorly and nasally. No retinal breaks were identified. Retinal detachment (RD) can be broadly classified as rhegmatogenous (the most common form, when a retinal break is present), tractional, or exudative (also called “serous”). In most cases of rhegmatogenous RD a retinal break can be identified on preoperative examination. Patients with rhegmatogenous RD may have preoperative choroidal detachments, but these are usually associated with hypotony and intraocular inflammation, and generally portend a poor prognosis. There were no epiretinal membranes or other features to suggest a tractional RD. This patient had features suggestive of an exudative RD. The patient was systemically well, on no medications, and had normal blood pressure. He had no past ocular history prior to the recent cataract surgery, other than wearing reading glasses. In retrospect he had noted poor night vision, “darker” vision in the superior field, and distortion of central vision for at least 6 months. Examination of the fellow right eye (Figure 2) showed similar findings to the left. The subretinal fluid was noted to change in position with alterations in the patient’s posture (“shifting” subretinal fluid). This sign is also suggestive of an exudative detachment. Right posterior pole and inferior periphery showing pigmentary changes and exudative retinal detachment similar to the left eye. Optical coherence tomography (OCT) showed subretinal fluid under the fovea in both eyes, with multiple reflective subretinal deposits (Figure 3). Fundus autofluorescence imaging (Figure 4) demonstrated widespread “leopard spot” changes corresponding to the hyper- and hypopigmentation seen in the colour images. 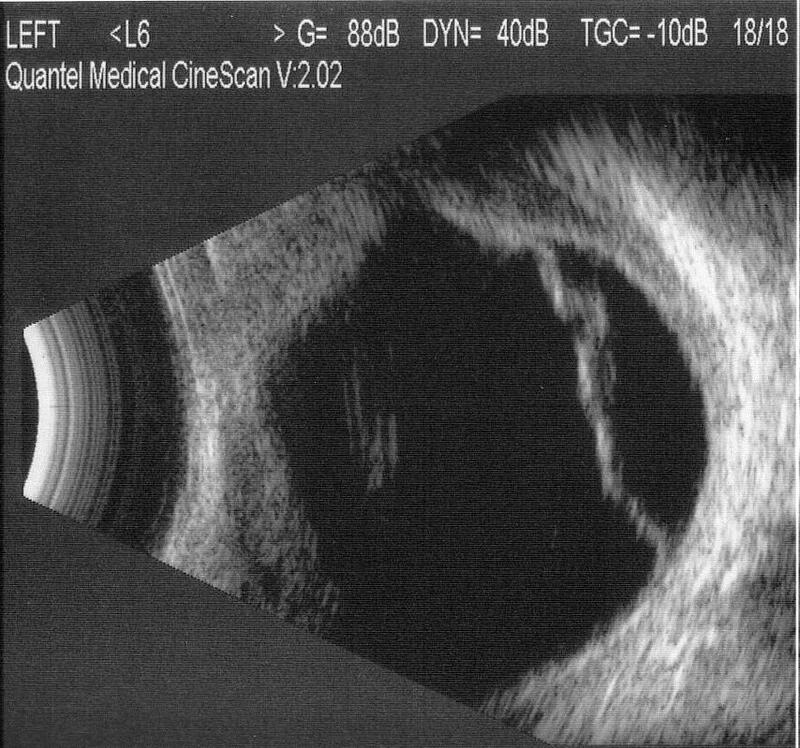 B-scan ultrasound showed scleral and choroidal thickening, choroidal detachment, and exudative retinal detachment (Figure 5). Axial lengths measured 23 mm in each eye. 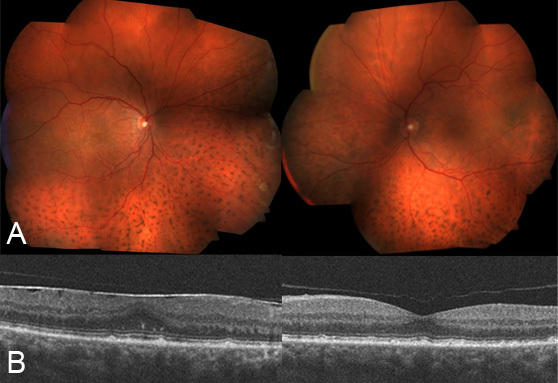 Right (A) and left (B) optical coherence tomography images demonstrating subfoveal fluid and subretinal deposits in both eyes. Fundus autofluorescence demonstrates widespread “leopard spot” changes. B-scan ultrasound showed choroidal and retinal detachment, with associated scleral thickening. Bilateral idiopathic uveal effusion syndrome (IUES). This is a diagnosis of exclusion. A number of the differential diagnoses above were excluded on the basis of the medical history and by the absence of intraocular inflammation or a tumour. Central serous chorioretinopathy was excluded as there were choroidal effusions, not just exudative retinal detachment. The normal IOPs excluded hypotonous choroidal effusions. In the absence of secondary causes, the diagnosis was uveal effusion syndrome. The axial length of 23 mm, and absence of pre-existing hypermetropia, excluded nanophthalmic / hypermetropic uveal effusions. The diagnosis was explained in detail to the patient. In view of the progressive nature of his symptoms and likelihood of further deterioration, surgical intervention was offered. Despite the marginally better visual acuity in the left eye, this eye had more extensive pigmentary changes and subretinal fluid, and was subjectively the worse eye. Informed consent was obtained for scleral window surgery on the left eye. Using the technique described by Gass1, deep partial thickness sclerectomies were performed in four quadrants (Figure 6). The sclera was markedly thickened. An anterior chamber maintainer was used to maintain normal IOP when a small full thickness sclerectomy was performed within the bed of the infertemporal partial thickness sclerectomy (Figure 7). Slow drainage of suprachoroidal fluid was noted. No attempt was made to drain subretinal fluid or decompress the vortex veins. Anterior chamber maintainer (A) and small full thickness sclerectomy treated with diathermy (B). The choroidal detachments resolved by the first postoperative day, and there was gradual reduction in the subretinal fluid. Two-months postoperatively, left visual acuity was 6/9 pinhole 6/7.5 and the patient noted significant improvement in his symptoms. Scleral window surgery was then performed on the right eye, with a similar postoperative course. Six months postoperatively, visual acuity had improved to 6/6 in both eyes. The fundus appearance and OCT scans are shown in Figure 8. Colour fundus image showing resolution of choroidal and retinal detachments (A). OCT shows no residual subfoveal fluid, and disappearance of most of the subretinal deposits (B). 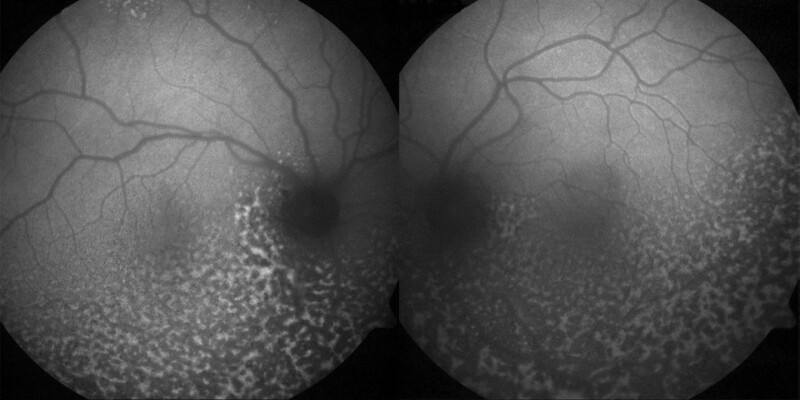 Note development of a mild epiretinal membrane on the right, and vitreofoveal separation on the left. Idiopathic uveal effusion syndrome (IUES) is a rare condition characterised by choroidal effusions, often with exudative retinal detachment.2 “Leopard spot” pigmentation due to chronic retinal detachment is a characteristic finding. Diagnosis is often delayed, and visual loss due to macular involvement by subretinal fluid common. This can be permanent in longstanding cases. Normal IOP and the absence of intraocular inflammation help to narrow the differential diagnosis. Uveal effusions may be primary or secondary. The secondary causes can be divided into inflammatory and hydrostatic (Table 1). Primary cases are termed “uveal effusion syndrome” and may be divided into hypermetropic (including nanophthalmic) and idiopathic. The latter demonstrates a strong male preponderance. Pathogenic theories include altered scleral permeability1,3,4 and vortex vein compression5. Most cases of UES respond to sclerectomy without vortex vein decompression6,7, suggesting that altered scleral permeability is the predominant factor. UES does not respond to corticosteroid treatment. In conclusion, early diagnosis of this rare condition is important, to avoid permanent visual loss from macular involvement. Resolution of choroidal and retinal detachment can usually be achieved with scleral window surgery. From Elagouz M, Stanescu-Segall D, Jackson TL. Uveal effusion syndrome. Surv Ophthalmol 2010;55:134-145. Idiopathic uveal effusion syndrome is a rare condition with characteristic clinical findings that include choroidal effusions, exudative retinal detachment and “leopard spot” pigmentation. Other causes of ciliochoroidal effusion with exudative retinal detachment must be excluded by history, examination and selected investigations. Surgery is usually successful in resolving choroidal and retinal detachment, and preventing further visual loss. Gass JDM. 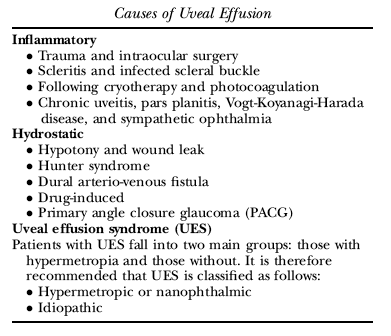 Uveal effusion syndrome: a new hypothesis concerning pathogenesis and technique of surgical treatment. Retina 1983;3:159-63. Elagouz M, Stanescu-Segall D, Jackson TL. Uveal effusion syndrome. Surv Ophthalmol 2010;55:134-145. Allen KM, Meyers SM, Zegarra H. Nanophthalmic uveal effusion. Retina 1988;8:145-7. Jackson TL, Hussain A, Morley AMS, et al. Scleral hydraulic conductivity and macromolecular diffusion in patients with uveal effusion syndrome. Invest Ophthalmol Vis Sci 2008;49:5033-40. Brockhurst RJ. Vortex vein decompression for nanophthalmic uveal effusion. Arch Ophthalmol 1980;98:1987-90. Uyama M, Takahashi K, Kozaki J, et al. Uveal effusion syndrome—clinical features, surgical treatment, histologic examination of the sclera, and pathophysiology. Ophthalmology 2000;107:441-9. Johnson MW, Gass JDM. Surgical management of the idiopathic uveal effusion syndrome. Ophthalmology 1990;97:778-85.